Passive Solar Energy Solutions. Passive solar house info and tips for saving big bucks. Passive Solar Energy is the free energy that the sun spills onto the planet every day. Here's info on how to use that energy to make your dwelling into a comfortable passive solar house. Passive solar info for house, patio and garden areas. Using passive solar energy requires a certain amount of knowledge of the sun's daily and annual cycles at your location. Energy efficient home designs will almost always have a passive solar aspect. Understanding the sun's habits will ensure that you can take the best advantage of it's heating and lighting capabilities. Every day the sun makes a track across the sky, beginning by rising in the east and ending the day when it sets in the west. Although the sun makes the same journey every day, it does not take the same route, tracking more to the North in June, July and August, and more South in December, January and February. If you live south of the equator then the sun is more overhead at your house during Dec., Jan. and Feb., the summer months. In June, July and August the sun is high overhead in the northern hemisphere. During those months when the sun is high overhead, the days are longer and hotter. At these times, homes need to be kept cooler and you'll want to keep direct sunlight and heat out as much as possible. The months when the sun is low in the sky, days are shorter and colder. These are times when we want to welcome the warmth the passive solar energy offers into our home. These annual fluctuations are felt more in the north and south than if you live around the belly of the earth (near the equator). Here's how to create a comfortable home using passive solar energy. Passive solar info and ideas for saving big bucks while you're saving the planet. Much of your monthly heating cost can be reduced with the thoughtful placement of insulation, awnings, verandas and plantings. Whether the passive solar energy techniques you adopt are simple or complex you can make a noticeable difference in your energy consumption. In cool climates, a good portion of your energy bill goes toward keeping the interior of your home warm during the winter and cool in summer. Inviting the sun to heat your home during winter days and blocking the sun's entrance in the summer will result in substantial energy savings every month, and it'll do it without inflicting a blemish on the planet. Double up on your insulation in walls, ceiling, floors and around electrical outlets, dryer vents, windows and doors. Insulation is your most effective tool toward keeping your hard won heat from migrating to the outdoors. Your biggest windows and doors should face south then west then east (north, west, east in the southern hemisphere). Passive solar heating is achieved by allowing the thermal rays of the sun into your home. Plan window and door openings to be most abundant on the sunniest sides of the house. Remember that although windows are great inlets for the sun's heat during the day they are also big time outlets for your warm air when the sun is not shining. If you're going green at home you'll want to add trees and plantings to your landscape any way. Here's how to get the most out of your plantings. Deciduous trees and plantings (leaves fall off in the winter) in front of windows and doorways provide lots of shade during the hot summer months when the sun rises high overhead but in winter when the sun sweeps low across the horizon the leafless plantings allow the sun to shine directly into your dwelling providing warmth to your living area. They are lovely and if you can't live without them you should have them, although they may cost you in the energy department. As you're aware, heat rises. High ceilings and lofts allow your heat to rise to the upper regions of the home. While the loft area is somewhere between toasty and uncomfortably hot, the lower level ranges between luke warm and uncomfortably cold. Attempts to circulate the hot air into the main living space can be frustrating. Create a closed off entry area or mud porch to keep the heat from escaping your passive solar house when the door is opened. Once you have the heat where you want it, keep it there. A separate entry area allows you to move in and out and greet guests without allowing the weather to blow into your living space. An energy efficient heater can help to regulate the temperature of your entry area. Covering windows at night prevents your warm air from migrating to the outside. Remember that warm air is attracted to cold air and will always move toward the cold unless discouraged to do so. Insulated window coverings or shutters will trap the warm air inside, and keep your passive solar energy where you want it. Trombe walls are a mass of dense, heat holding material (like stone or brick or even water tanks) that are situated in many a passive solar house. The wall is placed in front of a very sunny window where it collects warmth during the day and radiates it into the living area at night. wikipedia offers a more in depth explanation. Because a trombe wall is a major architectural feature many homeowners (particularly of existing homes) opt to use the less invasive methods of collecting passive solar energy, and still gain great benefits. Very little window area should be located on the non sunny side of a passive solar house in a cool environment (North in the northern hemisphere and south in the southern hemisphere). Just enough for safety escape routes and to create breezeways. Since there is no opportunity to collect pasive solar energy on this side the windows serve only as escape routes for your home's heat. Insulated coverings can further prevent heat loss. Patios add beautiful outdoor living space. Plan some patio area for the east side of your house to enjoy early morning sun while breakfasting. Planning a patio and a cooking area on the shady side of your house adds ambience and a cool summer living space. Cover west facing patios with a leafy pergola or arbor and place pots of shrubs or plant deciduous trees around the perimeter to keep it cool in the late afternoons. To help keep your passive solar house warm in winter and cool in summer install awnings over doors and windows. Awnings provide shade directly over a window or doorway to help keep high overhead (summer) sun from entering and heating the home in summer while still allowing the warmth of the low hanging winter sun access to the interior. Natural flooring materials like stone, tile and wood are cool in the summer, adding area rugs will keep floors warm underfoot during the winter. If you're building a new house consider incorporating passive solar energy principles into the design. In a hot climate it'll be much easier to keep your home at a comfortable and stable temperature if you prevent direct sunlight from intruding. Energy efficient house designs create shady areas using roofs, pergolas, trellises, potted plants trees and shrubs. Combine these with insulation and natural breezeways to provide a cool oasis on sultry days. When building or making renovations, ensure that all areas that allow air exchange between the interior of your home and the the great outdoors are well insulated. This includes floors, ceiling or attic, walls, around electrical outlets, windows, dors, dryer vents... you get the idea. Keeping the air temperature comfortable is easier than making it comfortable. 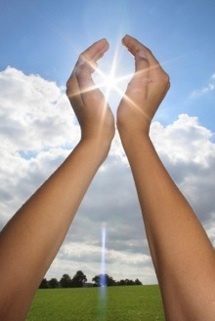 In hot climates, plan for your house to have it's back to the sun during the hottest part of the day. Outdoor living space should exist mostly on the shady side of the house. Glass doors and windows allow the sun to shine into the interior of a home and trap heat inside making it almost impossible to keep the space cool. Keep doors and windows that are on the sunny sides of your home at a minimum and/or covered with a deep veranda that keeps the immediate space around the openings cool. Plan to have your outdoor living space on the least sunny side of your home and the majority of windows, doorways and garden doors should open onto this side of the home. Awnings shade the window when the sun is overhead and keep unwanted heat from entering through windows. Not as effective as a veranda or pergola at keeping the area cool an awning for the ease and price of installation will, nonetheless, make a noticeable difference in your indoor temperature and in the success of a passive solar energy design. It can be difficult to keep the sun out when you need to if you have windows that are installed at an angle. Skylights, in hot climates should be installed where direct sunlight will not enter them or have insulated coverings to keep heat out when you need to. High ceilings allow the hottest air to rise above your living space, and they're beautiful too! A good choice for passive solar energy design for hot climates. A huge asset in hot climates is ventilation. Solar power gable or roof vents, ceiling fans, window and door openings. Create breezeways where opening doors and windows on opposite sides of the house allows the breezes to wend their way through your living spaces.. Insulated window coverings (drapes, blinds or shutters), especially on the sunniest side of the house, help to keep the heat out. In hot climates plan outdoor patios and garden areas on the shady side of the house (North on the north side of the equator and south on the south side). Establishing an outdoor cooking area on your patio keeps the house from becoming uncomfortably warm while cooking the evening meal. Not just a pretty face, strategicaly placed trees, shrubs, potted plants, trellises, pergolas and arbors provide cool shade in hot areas and are relatively easy to add to a passive solar energy design. Bare floors composed of marble, stone or ceramic tile stay cooler than wall to wall carpeting. During cooler seasons scatter a few rugs in well used areas. I'd like to say I thought all this up myself but truly the Anasazi cliff dwellings are evidence that the basic principles have been used for hundreds, and more likely thousands, of years. 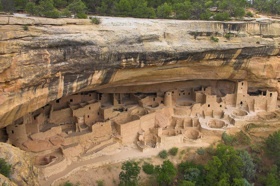 The Anasazi Indians colonized in giant, south facing, cliffside caves. During winter the low hanging sun was able to penetrate and warm the inside of the caves but in the summer the overhang of the cliff prevented the hot summer sun from entering, keeping the cave's interior cooler. Now that's a passive solar house.